The smarter You become the less You speak. In the following, you’ll get Punjab Food Authority Jobs 2019 Application Form NTS Test Date & Result from nts.org.pk. Latest job opportunities have been announced through Punjab Food Authority which is on purely contract basis initially for the Contract appointment policy 2004 of the Government of Punjab. Applications are invited from Punjab domiciled candidates for the following positions such as (Food Safety Officer, Assistant Food Safety Officer, Accountant, Enforcement Inspector, IT/Administrator/Computer Operator, Senior Clerk, Data Entry Operator, Junior Clerk) and these Jobs in Punjab Food Authority are based anywhere in Punjab. The provincial quotas shall be applicable to the above-mentioned posts such as 3% for Disabled Persons. Punjab Food Authority is the agency working under the Punjab Government established in 2011. It is responsible for the food safety and hygiene in the province, protection of wheat from pest and other hazards. It also fulfills the demand of food in the Ramzan / Christmas Bazaars. 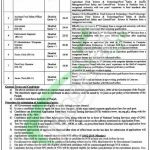 Punjab Food Authority Jobs are Government sector jobs in which rules and regulations applicable as per the rules of Punjab Government and Latest Punjab Food Authority Jobs 2019 can be examine from this page. Candidates wanted to apply for vacant positions should hold relevant qualification and experience as per the criteria mentioned in the following image and according to the criteria, MPhil, Masters, Bachelors, Intermediate, Matric and experience in relevant field after acquiring a qualification is required to apply. Now let’s jump towards how to apply the procedure for the vacant positions which are according to the rules of NTS. Candidates may download an application form and a deposit slip from the official site of NTS which is www.nts.org.pk or it can be downloaded from our site JobsAlert.pk. Duly filled application form along with a copy of CNIC and two recent photographs should reach on the following address given below. Candidates have to attach with application form original paid deposit slip of Rs. 400/- in favor of NTS. Test fee can be paid in any online branch of HBL, MCB, ABL, Meezan Bank across Pakistan. The last date for submission of application February 18, 2019. Incomplete application or received after due date will not be entertained. Last Date to Apply: February 18, 2019. Address: NTS Headquarter, Plot No. 96, Street # 4, H-8/1, Islamabad.